The City Council on March 2 discussed a Planning Commission recommendation to change the 2008 adopted Town Center Plan to exclude 240 housing units from the “D” zone (which is the Sammamish Commons civic center and park) and instead disperse these among the A, B and C zones in the rest of the Town Center. Some Council members want to retain the original Council decision of 2008 to allocate these 240 units on the Kellman property. This is the old mansion immediately west of the new Library. The Kellman mansion has been vacant since the City bought it, and it’s becoming rundown and is uninhabitable without major work. Artwork Source: Sammamish Review; Kellman property identification added. Staff originally proposed that the Kellman property be allocated the 240 units for affordable housing. One Council member reportedly wants to substantially increase the density of this parcel for high-end condos. The Planning Commission unanimously recommended that the Council rethink this. The Commission believed that with the scarcity of affordable land in the City, the location of this parcel as an adjunct to the Sammamish Commons park, and the need for a permanent location for the Community Center, that the City should retain this as a civic center reserve tract and not as a residential development. The Commission further believed, and recommended, that the 240 residential units should be part of the density bonus pool so that developers could have a greater number of units to claim as incentives for affordable housing throughout the other quadrants and the A, B and C zones (essentially everywhere in the map above except the teal colored and sickly pink areas). The Kellman property is nine acres, but much of it is sensitive area, meaning the 240 units would be on a much smaller buildable footprint and therefore essentially have far greater density than the mathematics (240 in nine, or mathematically 27 units per acre) suggest. To give you a sense of density, the Saxony project behind McDonald’s is 18 units per acre, or 50% less than the mathematical density for the Kellman property. I don’t know what the net buildable land area is for the Kellman 9, but you get the picture and can do the math. 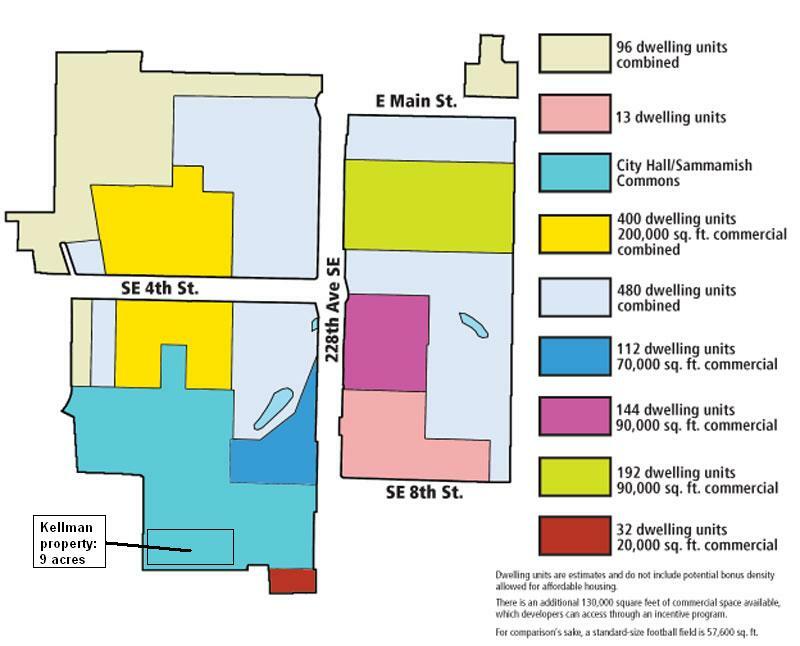 If the net buildable were half, or 4.5 acres, the density would be 53 units per acre and surely would require a tall building (restricted by the Town Center plan to six stories). Talk about something that would be out of place–especially if the council member who wants to put in higher density and high-end condos were to get his way. The Commission didn’t like any of these prospects and felt that this property should at least be considered for the permanent Community Center or restricted to some other civic use. Let’s hope at least four Council members agree. The 240 units would better be made available to developers throughout the Town Center for affordable housing and market-rate residential units. One final note concerning the prospect of the Kellman property being reserved for affordable housing: the Town Center Plan is clear; affordable housing should not be clustered–it should be scattered throughout the Town Center.